During World War II, 40 million people of different nations of the world were killed. The German people sacrificed 10 million; the Soviet people 20 million; and the rest [of those killed] were from Yugoslavia, Poland, and the other peoples. But after the war it was announced that 6 million Jews were among the victims, and that the war of annihilation had been aimed first of all against the Jews, and only then against the rest of the peoples of Europe. The truth of the matter is that no one can verify this number, or completely deny it. In other words, the number of Jewish victims might be 6 million and might be much smaller, even less than 1 million. The massacre of Israeli athletes at the Munich Olympics was reportedly personally supervised by Abu Mazen. Today Abu Mazen is a leading politician in Fatah. He served as the first Prime Minister of the Palestinian Authority from March to October 2003 when he resigned citing lack of support from Israel and the United States as well as "internal incitement" against his government. 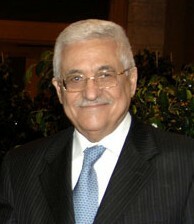 On January 9, 2005, Abu Mazen was elected President of the Palestinian National Authority. He took office on January 15, 2005. In our generation, people who deny in part or total the Holocaust are considered to be a spiritual descendant of Amalek. 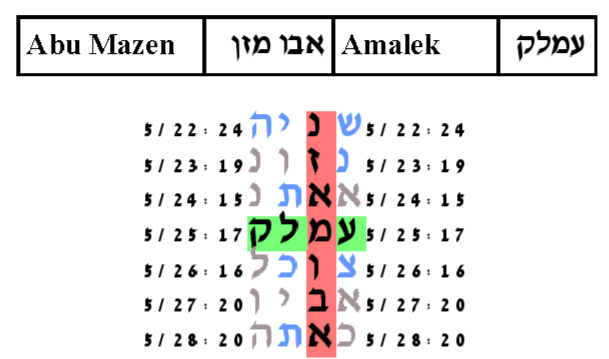 Our first table pairs the key word Abu Mazen with Amalek. The expected number of ELSs is set to 10. The resulting table is on a cylinder size of 1215 columns. The probability that a monkey text in the ELS random placement text population would have as small a table as this one is 5/10,000.